Part of the Hymns & Hymn Writers ~ Lindsay Parks series. Scientists and medical experts now tell us that full maturity of the brain and central nervous system does not occur until the age of 25. This may or may not be true … but history is full of amazing accomplishments of those much younger than a quarter of a century. Nadia Comaneci achieved Olympic gymnastics perfection at age 14. Louis Braille invented the reading system for the blind which bears his name at age 14. Mozart wrote his first opera by age 14. By age 16, Franz Shubert wrote his First Symphony. Garry Kasparov became the greatest-ever chess master when he was 18. John D. Rockefeller started the first of his many companies when he was 19. At this same age of 19, Bill Gates co-founded Microsoft. Willis Carrier invented modern air conditioning by age 20. In Dublin, Ireland, Charitie Smith, a young woman of 22, wrote one of the finest hymns that has ever been written. It was during these years of awakening and revival that Charitie’s first poem appeared in leaflet form. In 1860, scarcely 19, she wrote “O For The Robes Of Whiteness,” and it is preserved today as hymn #193 in the Believers Hymn Book. It is obvious in her writings that she was a deeply spiritual young lady, who knew her Bible and her heavenly Father. Her words are timeless, profound, and eternal. They are full of hope, forgiveness, reassurance, and courage. They are published as #15 in the Believer’s Hymn Book, with one verse of her original six stanzas missing. That verse may be one of the best. But, no doubt, these six verses comprise one of the finest hymns ever written. This hymn has been published in over 40 hymnals. 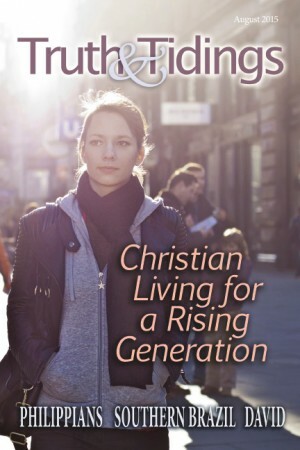 After having been sung to many tunes over the years, it was given several new tunes in recent years, and has achieved a renewed appreciation, by younger generations of Christians. I know that while in heaven He stands, no tongue can bid me thence depart. Upward I look, and see Him there, Who made an end of all my sin. For God, the Just, is satisfied to look on Him, and pardon me. The great, unchangeable “I AM.” The King of glory and of grace! The spiritual truths expressed in this hymn are immense. Satan does, and will, attack us. The flesh does, and will, betray us. But in all of our trip-ups and transgressions, our Savior is there, in the presence of God, for us. One has said “His acceptance there is my acceptance there.” He ever lives, He ever pleads, He ever represents … and He has, once and forever, “made an end of all my sin.” Another hymn writer has put it this way. “Now when God looks at me, He no more sees the things I’ve done – He only sees the blood of His crucified Son.” Charitie included all of these blessed truths in one small, but exceptionally spiritual hymn. Charitie married twice, and outlived both husbands. She moved to California with her second husband, and even late in her life, was still writing hymns and poetry. When she was 80, she wrote a hymn called “Redemption – Resurrection – Restoration,” and her gift as a wordsmith was still very evident. When she was 82, in the year 1923, she went home to be with her Lord, and was buried in Oakland, California.